“Brexit is a blessing for the world”, Trump. How will the pro-Brexit Left react? Trump and His Blessed Friend. …a vote to remain, whatever its motivation, will function in this context as a vote for a British establishment that has long channelled Washington’s demands into the Brussels negotiating chambers, scotching hopes for a ‘social Europe’ since the Single European Act of 1986. A Leave vote would be a salutary shock to this trans-Atlantic oligopoly. 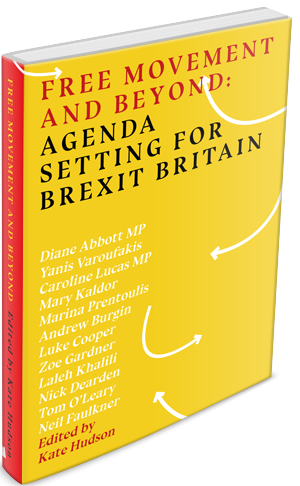 It would not bring about a new golden age of national sovereignty, as Labour, Tory and UKIP Brexiters like to claim; decision-making would remain subordinate to Atlanticist structures. It would certainly involve a dip in GDP—around 3 per cent, on the most plausible estimates, so smaller than the contraction of 2009. But the knock-on effects of a leave vote could be largely positive: disarray, and probably a split, in the Conservative Party; preparations in Scotland for a new independence ballot. Susan Watkins Oppositions. New Left Review. No 98. March-April 2016. Tariq Ali ‘Pleased’ Brexit Has Given EU ‘Big Kick’ up ‘Backside’. Alas, there were no new elections and Corbyn did not form a Labour government. 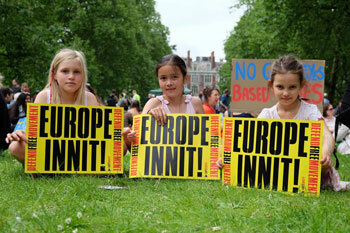 For now, though, it is plain that Blairized Britain has taken a hit, as has the Hayekianized eu. Critics of the neoliberal order have no reason to regret these knocks to it, against which the entire global establishment—Obama to Abe, Merkel to Modi, Juncker to Xi—has inveighed. Which will ultimately prove more important, and what the side-effects of each will be, remains to be seen. Ali at least appears to be one of those who consider that Trump’s victory was in part a result of opposition to this ‘neo-liberal order’. This is a transcription of some of Ali’s words in a video talk about Trump. The idea that because people have become unhappy with the results of ‘globalisation’ or ‘neo-liberalism’ that they vote ‘populist’ (heavily inflected by the nationalist defence of the ‘people’ not just against elites but against other nations) is so well-worn that it operates as en excuse for considering anything more than the origins of this discontent. Watkins’ account of the Brexit ballot is a long and contentious essay on this theme. If there’s any political thrust to this stand it’s as if there’s a healthy push to protest against the market, and the left’s task is to give it an extra shove. Thinking about where the urge is going to end up once it gets into the political system is ignored. Watkins and Ali are only some of the apparently left-wing people who failed to think through the consequences of their call for Brexit : what would happen after leaving the EU “Neo-liberal” framework (a gross simplification that ignores the weight of EU regulation) in a world dominated by large large capitalist powers. The biggest capitalist power, the USA, is now in the hands of somebody who, whatever the motives of his supporters, who is pretty sure that Brexit is good news for his turn to an America First planet. We await a response to the new shape of the “trans-Atlantic oligopoly” from the pro-Brexit left’s “insider bubble”. Describing Brexit as a “blessing to the world”, the president said the vote to leave the EU was a “tremendous asset, not a liability”. He vowed to do a free trade deal with Britain, while attacking the European Union – which he described as “the consortium” – for making it hard for companies to do business. 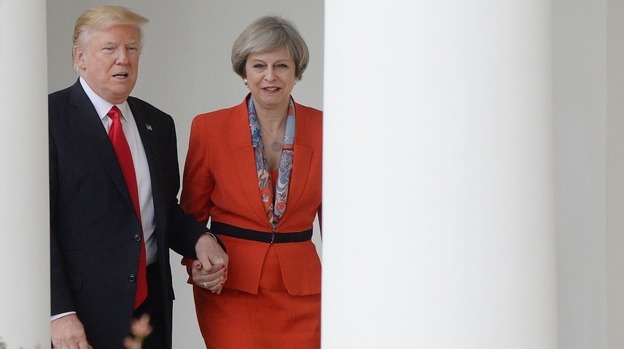 Mr Trump said that the people of Britain voted for Brexit because “people want to know who is coming into their country and have control of trade”. Brexit Good for Terra Firma, Bad for Most People, Hands Says (22nd of January, Bloomberg Markets). The U.K.’s decision to leave the European Union is going to lead to dramatic changes in the way the country’s economy operates, which could create opportunities for a firm like Terra Firma Capital Partners, Chairman Guy Hands said. The country will have to get rid of much of its social safety net and may see a 30 percent decline in wages in real terms in the next 20 years to enable it to compete outside of Europe, Hands said in an interview on Bloomberg Television. Debt will command higher interest rates as more risk is ascribed to an independent U.K., and immigrants from Europe will be replaced with workers from the Indian subcontinent and Africa, who may be willing to accept “substantially” lower pay, he said. No doubt the pro-Brexit left imagine that this will all melt away with some big demonstrations and other protests culminating in a left ‘populism’. There are few signs of anything with this degree of coherence or support emerging in the UK in the immediate future. 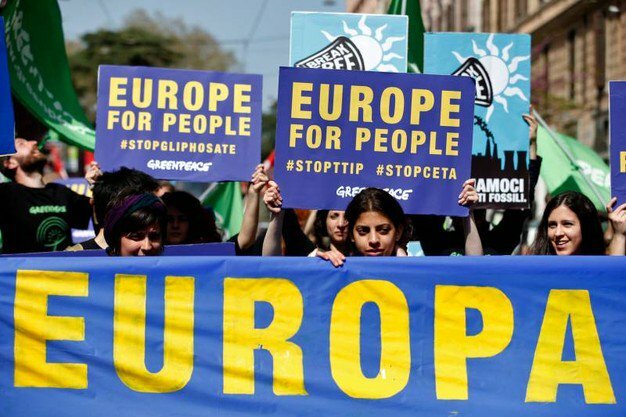 There is no sign that a force of this nature, based solely in Britain, outside the institutions in which the majority of the European Left operate, the EU, could stand up for a progressive model to oppose to Trump and his Tory friends. New Left Review (Verso) ‘abridges’ Badiou on Anti-Semite Charlie Massacre. Abridged Version Available on Verso Blogs. There is a debate about a translation of Alain Badiou’s Le Rouge et le Tricolore on the Verso Blog (New Left Review). Badiou considered the attack on Charlie and the Kosher supermarket to be fascist. He made these observations to back up the assertion. D’abord, il est ciblé, et non pas aveugle, parce que sa motivation est idéologique, de caractère fascisant, ce qui veut dire strictement identitaire : nationale, raciale, communautaire, coutumière, religieuse… En la circonstance, les tueurs sont antisémites. Souvent le crime fasciste vise des publicistes, des journalistes, des intellectuels ou des écrivains que les tueurs estiment représentatifs du bord opposé. A fascist-type crime, in my view, has three characteristics. Read rest on Verso site. Why is the word “anti-Semitic” (as in les tueurs sont antisémites, the killers are antisemites) left out? D’abord, il est ciblé, et non pas aveugle, parce que sa motivation est idéologique, de caractère fascisant, ce qui veut dire : stupidement identitaire, nationale, raciale, communautaire, coutumière, religieuse… En la circonstance, les assassins avaient visiblement comme cibles trois identités souvent visées par le fascisme classique : les publicistes considérés comme du bord opposé, les policiers défendant l’ordre parlementaire haï, et les Juifs. Certainly it does not mention anti-Semitism. But as this is close to the crux of Badiou’s rhetoric (I was going to say argument, but the whole article is more a sustained exercise in rhetorical fireworks than a calmly laid out set of reasons). Badiou has himself been accused of anti-Semitism (for calling Sarkozy – mother’s father, Jewish – ‘l’homme aux rats’). It is therefore of more than causal importance. Why, then, was the term absent in the Verso piece? The audience for the Le Monde article is, on any definition, greater than that of Medipart’s. So why not go for the stuff people have actually read in France? To coin a phrase, if Le Monde ‘abridged’ then, here, in the case of this translation, we have Vice Verso. Perhaps there is a wider background. This is what New Left Review veteran Tariq Ali thought about the murders at Charlie (no mention of the Kosher supermarket at the Porte de Vinceness, or anti-Semitism at all). It may well this is the message which New Left Review and Verso intends to broadcast, above any other. There is plenty of self-indulgent cack on the Verso site to endorse this judgement on their ‘angle’ about Charlie Hebdo. Sunday’s marches above all saw the educated bourgeoisie contemplating its own strength and giving in to its self-enchantment. It’s not certain, however, that this makes for a ‘country’ or even a ‘people’, as we may well soon have good reason to remind ourselves. These are all points where lurid cultural racism fuses with blind hostility, crass ignorance and the fear that the vast mass of Africans or banlieue residents – the wretched of the earth – inspires in the hearts of our self-satisfied petty-bourgeois. Well – it’s not important? New Left Review at Fifty. New Left Review at Fifty: Is There Life in Their Politics? New Left Review is a “left intellectual project”. What is the nature of this undertaking? On its fiftieth anniversary can a balance sheet, and future prospects be drawn? The British New Left, respectively the original New Left from E.P.Thompson and John Saville’s New Reasoner and Stuart Hall from the University and Left Review, that combined in 1960 to found the Review, and the Second New Left, whose chief theorists, Perry Anderson and Tom Nairn, as well as Robin Blackburn, ran the journal after 1962, is often the object of intellectual biography. Assessing the value of the individuals’ work. Or on the magnificent set-piece battles between Thompson and the later NLR’s editors. 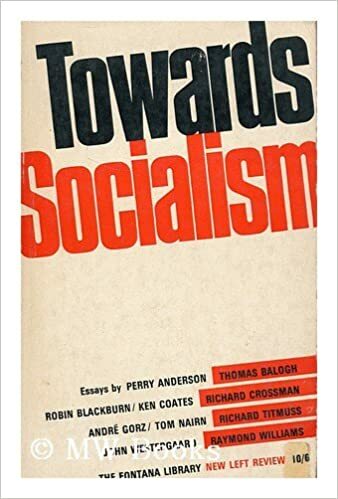 Here there is a different object: the transition from the original New Left’s aim to “make socialists” to New Left Review’s (1962) Editor, Anderson and his more ambitous plans. That is, to his ultimate goal, to produce a fresh layer of left intellectuals who would help end British anti-theoretical “exceptionalism” and pave the way for socialism. History, careers, and disputes, should be seen in the light of these objectives. Susan Watkins in the Editorial to the 61st Edition (Second Series) of the Review, talks of its launch in 1960 as “one of a myriad of small harbingers of left renewal”. Its early enthusiasm for “anti-colonialism”, Third Worldism in general and Latin American guerrilla activity and Cuba in particular, were causes championed by a much wider international New Left (notably American and French). They were succeeded by “intensive debates within Marxism” of the end of the decade. But what really brought the New Left prominence, and shaped the journal’s frame of reference, was 1968. Leading up this was the movement against the Vietnam War, whose British wing, the Vietnam Solidarity Campaign (VSC) had a decidedly New Left tinge. This, as we are frequently told by veterans, was a tumultuous period, at its most spectacular in May, marked by student revolts, the counter-culture, the democratic and humanist socialist resistance to Stalinism, and, above all, the stirrings of mass workers’ action in Europe. Even in ‘sleepy London’ the London School of Economics saw a student occupation – which displayed solidarity with French protests. In the VSC held a mass demonstration in September ’68, causing manufactured panic in the media, and, saw a ‘Maoist-Anarchist’ splinter faction (several thousand strong) march on Grovesnor Square. Violent clashes with the police ensued. 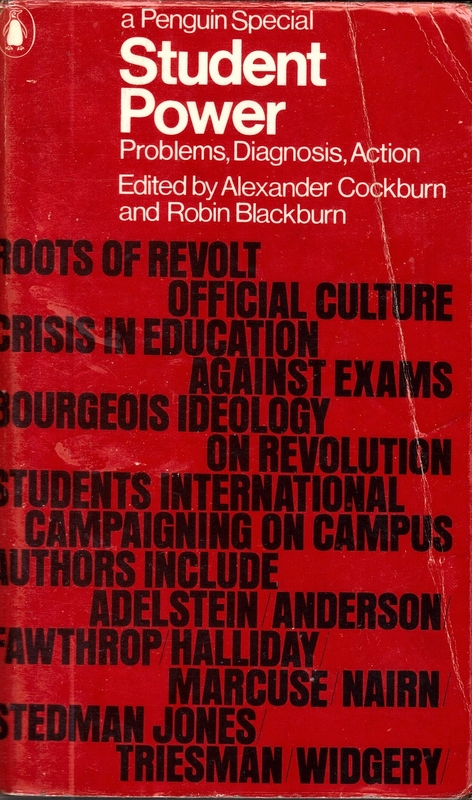 A Revolutionary Socialist Students’ Federation (RSSF) came into being, with encouragement from the New Left’s publications. Its influence, split and reformed into various factions, rippled through British campuses in the years to come.